All of us have a few parenting tips…let’s share them this week! We all know that there is not an “official” parenting tip book…wouldn’t that be nice!! But, in actuality, it is best for parents to develop their own “parenting book”. Parenting your child is unique to you and your child. Develop your parenting instruction book by reading, watching others, and asking parents you admire what their best advice is. Trust yourself and your ability to be the best parent to your own child. 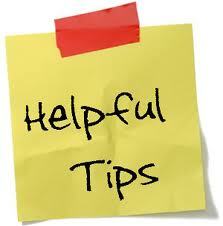 Over the next few days I will share a few of my tips. They are in no particular order, just a few tips that have worked for me over the last 30 years. Share some of your own too! We all can use a little advice! 1. Show your unconditional love for your child every day. Use your words of love verbally, and written. Use your touch with physical hugs and kisses even as your child gets older; older children need that loving touch just as much as younger children! Even if there is very little reciprocal hugging, the need is there. Teach your child to express his or her love with words, touch, and actions. Begin each day and end each day with “I love you”. No matter how the day has been or what is in store, those three words make everything start or end well. Really listen, stop what you are doing and give your child your attention. If you have more than one child, carve out a few minutes every day to share with each child individually. A few minutes on the bed talking each evening worked for us! Stop what you are doing when your child needs to talk, put the phone down, the computer away, and turn off the TV. Keep adult problems adult problems; don’t share them with your young child or teen. Don’t belittle your child’s fears; monsters can be very “real”. Comfort your child when he is scared first, and then teach coping strategies. Show your child that you will keep them protected. Protect your child from violent TV, videos, and inappropriate web sites. Discuss current events and news—don’t ignore what is happening in the world, but don’t dwell on world problems that are too adult for your child to emotionally handle. Routine brings stability and security to your child. Routine and order helps a child manipulate his world. Routine and order helps a child become a better student. Responding in a predictable way to your child’s behavior results in a child who knows what behavior is expected. Sporadic discipline and consequences results in poor behavior. A child who receives inconsistent discipline will push the envelope until a limit is set. Do the unexpected—eat ice cream for dinner, stay up too late, break your routine occasionally. Enjoy a few minutes of fun every day. You cannot care for your child if you do not care for yourself. Teach your child the lesson of self respect by “refilling your pitcher”. Show your child your passions, your child will learn to develop his own. A good parent is one who likes himself or herself. A happy marriage is the best gift you can give your child. Your child should be the satellite of your marriage, not the center. Healthy adult relationships teach children what relationships should involve. Teach your child that you make mistakes too. Saying “I’m sorry” and meaning it repairs nearly any parenting mistake. Teaching your child to apologize with true meaning is one of life’s greatest life lessons. You do not have to know everything to be respected by your child. Work together to find answers. Your child feels more secure when he or she knows that you are not “pretending” to know. Your child will figure out that you don’t know everything eventually…trust me! Teaching responsibility is key to becoming a productive adult. Chores help a child feel like a valuable member of the family. Self esteem is built on accomplishments—including small accomplishments like chores. Chores help a child learn how to time manage. Help your child develop his or her inner moral compass. Develop a group of core values that represent your family. Talk often about right and wrong, and what feelings and emotions are connected with each. Encourage your child’s moral judgment, role play how your child would react in situations that would call for that judgment. Successful families have a spiritual core of beliefs. Make those beliefs clear in your words and actions as a family. It is easier to parent when you have the support of others who agree with your parenting values. It is so helpful to be able to bounce parenting issues off other parents for advice. Your child will benefit from other families with the same moral guidelines. Your child needs other adult role models in his or her life besides you! Each morning brings a new start for you and your child. Let yesterday go, your mistakes and your child’s mistakes should not be dwelled upon the next day. Start every day with a new beginning. The first 15…more tomorrow. Can you add a few to these today? ← Even a little bit of lead exposure is too much in children! Interact with your children how they want to interact – i.e. play games they suggest/want to rather than what you think they want to play.